Castlebar - County Mayo - Not Such a Storm in a Teacup! Storm damage Achill Island, Mayo (Photo by Roisin Lavelle). 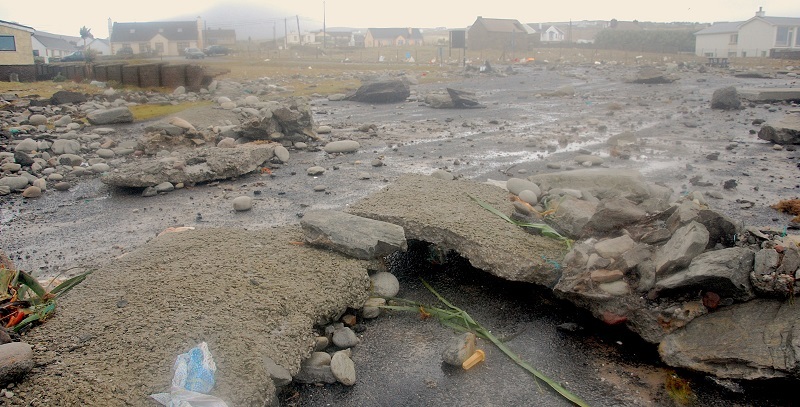 Recent weather events have highlighted how storm activities are a real threat to Achill Island's communities and the need for immediate action. Storms are expected to increase due to climate change, placing coastal communities at particular risk. An up-coming event on Wed June 20th (7pm, The Strand Hotel, Dugort, Achill) will shed some light on how Achill's coastal communities respond to storms and provide some initial ideas around solutions to potential future weather risks for the island. Local action has been shown to be a powerful driver in responding to coastal risks. This event is the first step in formally bringing together the community with climate action experts so that opinions can be shared, and people can directly get involved in helping the local community. A research team led by NUI Galway's Geography Discipline will present results from an EPA-funded project on coastal storms that gathered data from Golden Strand over three years with contributions from Achill residents. At least two significant storms occurred during the project, giving very interesting insights into the questions posed by the team. The talk will also cover various ideas from international ‘good practice' on how local communities and authorities can respond or adapt to increased storm activities, including a coastal erosion case study from Co Kerry. Mayo County Council's Climate Action team will conclude the event with information and helpful advice on how to become involved in direct climate actions in the local community. There is a very strong sense among the research team and the Council's new climate action team, that locals' views, concerns and ideas should be a central part of any decisions on climate actions in local areas. This is a chance to meet them face to face, get to know them and let them know your feelings and ideas about Achill Island and its storms. It will be an informal setting with the researchers and council staff moving around the room to chat over a cup of tea. Admission:	It is a free event.